Purchase online MP1405/TP4059 Li-ion Battery Charger Module in India at low price from DNA Technology, Nashik. 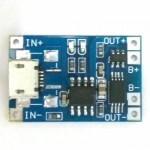 This is a low cost Li-ion Battery Charge Controller MP1405 (TP4056) perfect for electronic amateurs and enthusiast. It is also called as 18650 Module as its is extensively used to charge 18650 Li-ion Batteries.